Ellen: Hi, James! So great to meet you! If you could, tell us a bit about your current fitness goals. James: I am at the start of training for my most exciting and ambitious challenge yet! In May 2019, I will attempt to run more than 800 miles in 9 days, from the bottom of the UK to the top. If I do that I will break a 12 year old world record. My journey will start at Lands End, in the south west of the UK, and finish in John o’ Groats, in the north east of Scotland. The journey is often called LEJOG. It’s a monumental challenge, but something that I’m very excited about! Ellen: Holy smokes! That sounds crazy-epic, for sure! Tell us about what a typical training week looks like for you. James: Sure thing! If I don’t have a race in the diary, I usually run about 70-80 mile weeks. I’m lucky that I work close to my home and so I can run along the River Thames as part of my commute. Which means I can run 7 miles if I go directly and I can add on more miles if need to. I recently did a 28-mile run before work! If I do have a race, my weekly mileage can get up to around 120 miles. I recently completed (and won!) a 100k race in early July. And so my training in June was one of my biggest ever months, at 703k. Although these types of months are going to be standard as I build up to my challenge for next year!! I mix up my sessions between recovery runs (I do LOTS of slow running! ), speedwork, tempo, etc. I also do a couple of strength and conditioning sessions a week, plus yoga twice a week. Ellen: Well, color us impressed! That's an incredibly comprehensive and well-rounded training schedule for anyone, and especially for a guy with a family and a career. How do you stay on top of all of this? Do you have a coach, and if so, how do you work together? James: For the past couple of years when I was training for marathons, I had a coach. It takes so much of the hassle out of creating plans for myself, which I had done up until that point. And that actually took up a lot of my time. We parted ways a few months ago when I decided that I was going to run LEJOG as it wasn’t his area of expertise. I would definitely recommend getting a coach for the following reasons: They can help you train more effectively, they have the experience of what works, they can help push you through your boundaries, and they tell you what you need to hear. Additionally, they are more objective about your performance than you are. Coaches have been most effective for telling me that I need to rest, rather than pushing too hard! Ellen: Those are all great reasons to have coach, and you must feel incredibly lucky to be working with one who has had so much experience and success with the specific goal you are working towards! Okay, let's switch gears for a bit. What can you tell us about your runner origin story? James: During school I was into all sports. Football, cricket, rugby, swimming, and pretty much anything that was available. My first proper running experience was winning a cross country race at school. The race was out of about 300 people, including kids older than me. At university I did my first half marathon in about 1:35 and then switched my focus to triathlon. I signed up for an Ironman event as my first one. It looked amazing and like the most challenging thing you could possibly do. The people who completed it looked like superheroes! Over the next few years I did three more Ironman events and three half Ironman events. I then realized that I was much better at running. Plus, I got knocked off my bike a couple of times. So I switched my focus to running a few years ago. Since then I’ve done a few marathons and managed to get my PB down to a frustrating 2:30:05 (why couldn’t I have gone 6 seconds faster?!?!). I’ve also done a few ultras including the Marathon des Sables — a 150 mile multi-stage race in the Sahara desert where you carry your own food and equipment. I recently did a 28-mile run before work! Ellen: Dude! That's a seriously impressive running resume! You surely have a lot to feel good about here. What is your proudest athletic achievement and why is it so special to you? James: I recently won a 100k race in the UK called The Serpent Trail. Although I was pleased with the result, I was most proud of my performance. It was a blisteringly hot day but I got most elements of the performance correct — including food, drink, pacing, equipment and race strategy. The Marathon des Sables was the most special event I’ve taken part in as it was a once-in-a-lifetime experience. I’m proud that I completed it, although I’m disappointed with my performance. That’s because there is a long day of around 55 miles and I messed up my strategy. That was really frustrating as I felt great physically. So I have some unfinished business in the desert! Plus, I’m a much better runner now than I was then. Ellen: Well, we are super-impressed with your accomplishment and all the learning perspective that you took from it! Which brings us to our next question: What is the greatest life lesson running has taught you thus far? James: That you can achieve almost anything you want as long as you put the effort in. I started running in 5ks and have now completed multiple Ironman events and the Marathon des Sables and I've even won races from 5k, 10k, half marathons, marathons and now a 100k ultra! My challenge to run LEJOG is going to be the biggest and most difficult by far. But I truly believe that I can do it as long as I’m fully committed. Ellen: Well, we wish you all the best, and you seem to be in good mental and emotional place to really crush it! Any sage advice you would offer to runners who are tackling the marathon distance for the first time? 1. Start the race slower than your target average race pace. Make a conscious effort to do this because otherwise you’ll get carried away in the first few miles and set off too fast. Everyone does it, including me in my most recent marathons! Before the race, specifically plan what pace you’re going to run in those first 5 miles and then stick with it on the day. It only needs to be a couple of seconds slower than your target average race pace. Then gradually increase your speed during the rest of the race. Don’t worry about people being ahead of you in those first few miles. You’ll easily catch them later when they slow down as they’ve started too fast. And you’ll get a much greater sense of joy from overtaking people at the end of a race, than overtaking people at the start of it. 2. Don’t try anything new in the 2 or 3 weeks before the race. And especially not on race day. This is especially important when it comes to nutrition. In my first Ironman I made the stupid mistake of trying gels on the run for the first time. This was because I didn’t research what would be available in the race and so hadn’t trained with them. Needless to say, I had some serious stomach issues on that day which wasn’t pleasant! But I’ve seen people do this with kit too. Don’t race in a new pair of running shoes that you purchases at the marathon expo the day before the race! Ellen: Very sage advice, indeed! Our newbie marathoner readers will benefit from it, for sure! When did you start incorporating technology into your training, and what aspects of it do you find most valuable? James: I don’t rely on technology too much. I’ve always had a watch, but other than that I keep things fairly simple. I don’t use a heart-rate monitor as I tend to go on how my body "feels". I see a lot of athletes continue to try to hit a specific heart-rate zone or pace in a training session even when they’re feeling awful. That can lead to injuries, disappointment and missing your goals. But I do love looking at my data! Which is where SportTracks comes in. I love the fact that you can cut and dissect your training really easily. And I really believe that SportTracks has helped improved my performances. Ellen: Awesome sauce! We're so stoked to know that SportTracks has positively impacted your training, and we're grateful for you kind words! How did you discover SportTracks, and what made you decide to subscribe? 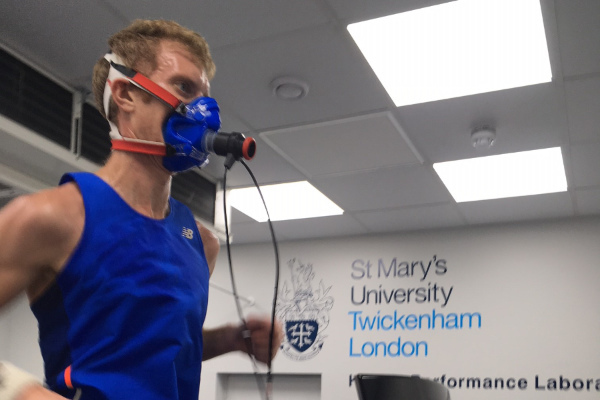 James: I love analysis and getting into the numbers of my running, as well as the numbers for some of the other runners and triathletes I help. SportTracks has been the best option for allowing me to do that. I first started using it about 3 or 4 years ago. I did a lot of research into different trackers at the time, and the value, flexibility and ability to manipulate my data was the reason I chose SportTracks. I recommend it to my friends who are into running and cycling. Especially if they want to take their performance to the next level. Ellen: Well, we really appreciate your usership and we always enjoy checking out your crazy-speedy long distance data! Do you get anything from SportTracks that you don’t get elsewhere? 2. The ability to really dig into your data: If you want to improve your performance then you really need to understand where you are strong and what areas you need to work on. 3. The huge amount of contextual data: For example, you can look and see what the weather was like and how hot it was. Which is really important for understanding your performance. Ellen: Okay, let's wrap up with one more question: Have you found your ideal race distance, and if so, can you tell us about the process of finding it? James: The longer the better! I've never had good flat-out speed, so I always knew that the longer distances were where I could do a better job. I also can't seem to pace myself properly at 10k and 5k's and always end up setting off too quickly. My best performances have been at the marathon distance but I enjoy half marathons too. Which is a good sign for my next challenge! Ellen: Well, you sure seem speedy to us! Thanks so much for taking the time to chat with us! Thanks to Ellen, Sam and all the guys at SportTracks for this one! I hope some of the advice is useful for all the readers. For more tips, advice and to follow my LEJOG journey, please check out my brand new site - www.JamesRunsFar.com. You can also get the latest info on how to improve your performances, simply by signing up! And I’d love to hear from you as well - My email is James@JamesRunsFar.com.